I have crashed and burned. I always crash and burn for about one week. on before are all swirling in my head - AT ONE TIME! Delta Faucets to tell you about. Seriously I had no idea how much fun faucets and plumbing could be! Of course all the people at Delta, the company who brought us bloggers there, and the bloggers who were on the trip were also A-M-A-Z-I-N-G! and it was a DUH moment for me. I think I got stuck in the fact that it had bark in the title and bark is for Christmas, right? perfect for taking on a picnic or to a party when you cannot make the real thing! 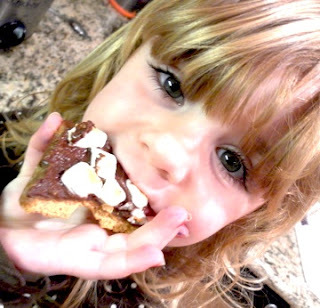 If you have read my blog before, you know I am a sucker for anything s'mores related. If you have never read my blog before, well, now you know too! I love this idea for the holidays, but seriously how perfect is this for summer. S'mores and summer go together right? 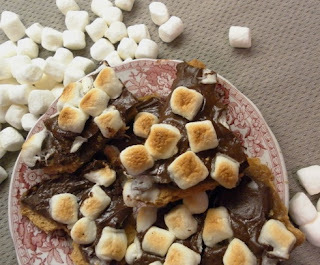 make up some s'mores bark to take along. Arrange graham crackers in a single layer on the cookie sheet. Place them right up next to one another. You may have to cut or break apart some of the graham crackers. Melt/Stir butter and brown sugar together in a saucepan over a medium flame. Bring the mixture to a rolling boil, being sure to stir constantly to avoid separating or scorching. Once at a constant boil, pour the mixture over the graham crackers. Use a spatula to spread it over the crackers in an even layer. Place toffee in the oven for 5 minutes. It should be bubbling all over. Remover from the oven and cool for one minute. Sprinkle the chocolate chips on top of the hot toffee and let rest for about 1 minute, then spread with a spatula or knife. Once evenly spread, sprinkle mini marshmallows on top (I press them down just a little). FOR FUN! I put the entire cookie sheet in the broiler for 2 minutes to toast the marshmallows and then popped them in the refrigerator to firm up. The toasty taste is the best! You can also add other favorite items like toasted pecans...or what about joining the bacon craze and crumbling some crispy bacon on top for bacon s'mores bark! Oh yum! I even like the name. Thanks for this new idea. :) Have you tried those caramel swirl marshmallows? They are SO delicious on s'mores! Miss Crantons offers luxury personalized handmade chocolates gift basket Handmade Chocolate Gifts Delivered UK & Worldwide. We supply chocolate gifts throughout the year. Incredible choice at great prices.supply all over UK and worldwide. I'm seriously salivating right now. 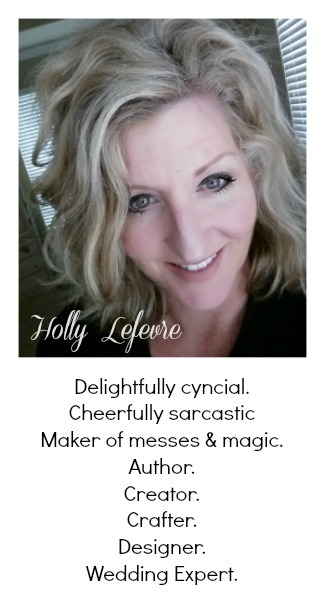 I'm so glad you finished your book, Holly! I'm ready to see you back here more regularly. :) This recipe sounds fantastic! Well, you know my bizarre aversion to s'mores (one that is likely to get me blacklisted from most groups of happy campers, and certainly the Girl Scouts), but once you said the magic word, "bacon", you had my attention. The salty element may just be the cure to the extreme sweetness that drove me to the Anti-S'more-League. Tee hee! This recipe sound absolutely fabulous. I can't wait to try it. Hope you have some time to recuperate. Looking forward to the details of the Delta trip. why why why whyyyyyyyyy?! Now all I can think about is s'mores. I love smores- this looks really good. I like to give as a teacher/or school gift a small baggie filled with smores ingredients and a cute saying: "here's to SMORE fun" or something like that. I am giving them away at BUNCO next month, I will share photos! Have you ever made "smores" with Oreos, strawberries and marshmellows? You have to eat the frosting out of the Oreos first....oh darn! Those s'mores sound so delicious! Too bad I won't be able to make them. I have to fit into a dress by the middle of next month and must drop 8 lbs. before. I adore the new look of the blog, Holly. It's refreshing and fun! MERCY...this sounds perfect for summer. When grandgirls come over to spend the night, I'll have all ingredients on hand and they will LOVE making them. Thanks, sweetie girl, for this recipe. Seriously yumm-o recipe there! And major finger licking!! Love that! Smores without the campfire? Genuis! 2. That dessert looks delish! I am your newest follower! Your blog is ADORABLE! I would love it if you stopped my blog and became my newest follower too! I am so excited to link up to your party! Thank you!